Learning a new language is a very difficult task. But in the case of the Japanese it can be even more difficult because of the many different symbols its writing system has. That makes it more complicated to read Japanese sentences and get used to the way they are written. To solve this problem, we have improved the way the examples are shown in the dictionary. First of all, we are showing more sentences than before, taken from the great tatoeba project. But also we are now separating the sentence in words and you can now click in every word to get more information about it. 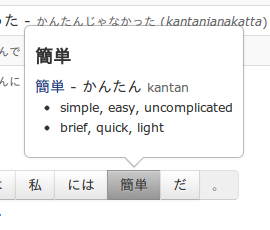 We believe this change will make it easier to understand how a word can be used in a sentence and will make the sentence easier to read for that people who is still not ready to understand kanji. I hope you enjoy those changes! Nice, now I don’t have to open a bunch of dictionary tabs just to read the example!